In either wet or upland forests, including silver maple, beech-maple, oak, and oak-hickory; rarely in sunnier habitats such as ditches and roadsides and wet open areas. A Keweenaw Co. record (O. A. Farwell 563 in 1887, BLH), is not mapped as it is far out of range and may well be mislabeled. 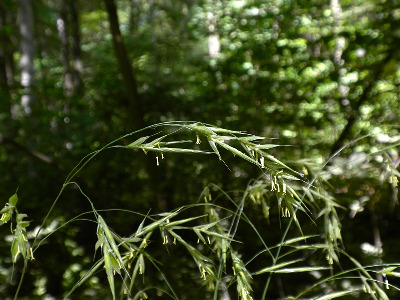 Very rarely the lemmas and glumes are all completely glabrous [f. glabriflorus (Wiegand) E. G. Voss]. In Michigan specimens, Bromus pubescens is generally less hairy on the sheaths than B. nottowayanus; nearly glabrous plants may have only a bit of pubescence at the sheath apex, making herbarium specimens harder to tell from B. nottowayanus with the key if the shiny leaves are not so evident. A rare specimen of B. kalmii in which the 3-nerved condition of the first glume is obscure might run here, but can be distinguished by the shorter awn (2–2.8 mm long) and shorter anthers. An Oakland Co. specimen from a tamarack swamp (O. A. Farwell 2856) appears to be intermediate with B. ciliatus and may be a hybrid. See Veldkamp (2009) for nomenclatural comments and the authorship of B. pubescens. MICHIGAN FLORA ONLINE. A. A. Reznicek, E. G. Voss, & B. S. Walters. February 2011. University of Michigan. Web. 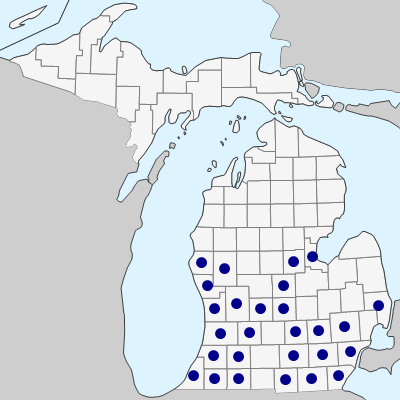 April 21, 2019. https://michiganflora.net/species.aspx?id=2037.